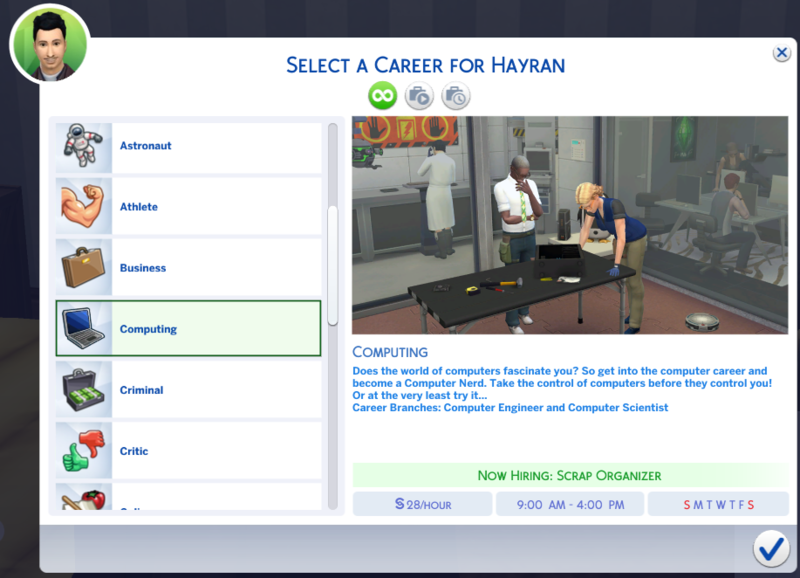 Tech Guru's career is good explored and well worked on The Sims 4 about some IT/Computing stuffs, but I'd like something more "get the hands dirty", close to the reality I live when it comes to working with computers (I work with IT/computing IRL, more with hardware). 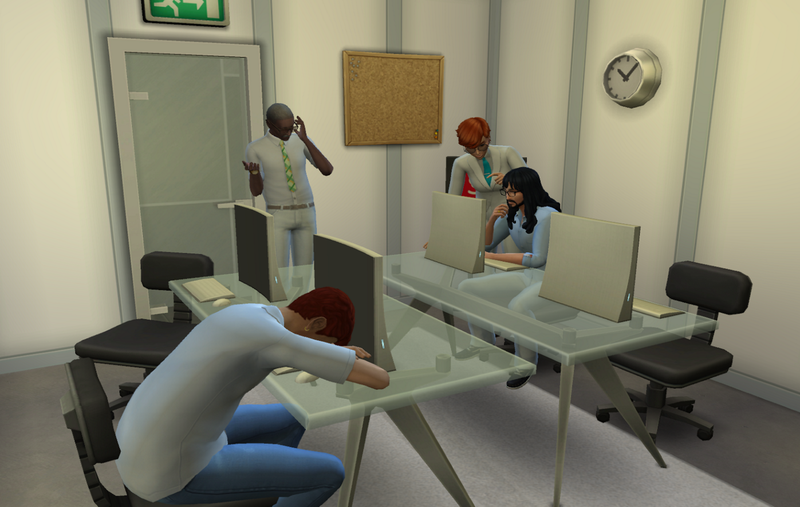 The objective is to make something more "industrial/company working in", but without losing the way of "The Sims like", with little humor, and freedom in promotions and job roles. 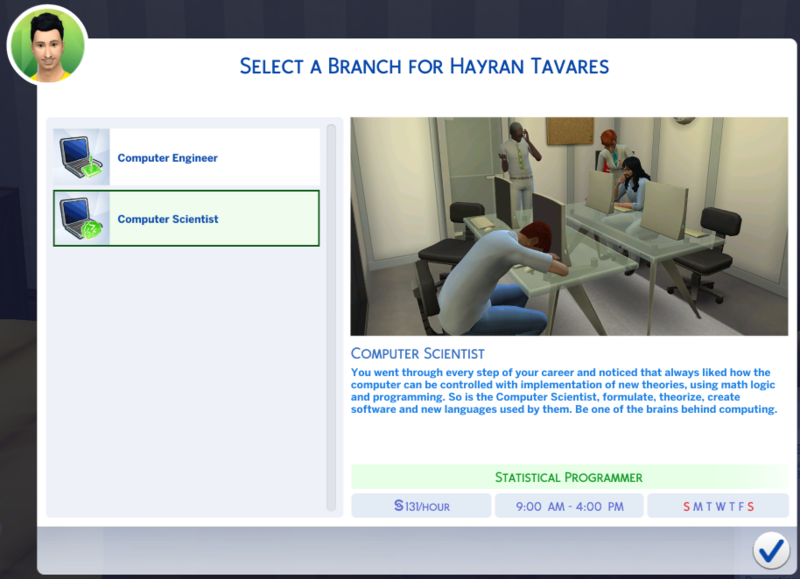 So, in this career you can will work more with skills like handiness, logic and programming, having available two track; Computer Engineer in the focus on handiness and logic, and Computer Scientist on the focus in logic and programming, with 10 levels and fair day off system (most closer of careers of TS4). This career does not replace Tech Guru, so you can have both without any problems. There's nothing better than starting the job in computing having contact with the soul of computers, you as a Scrap Organizer need to get the hands dirty and separate the old computer boards properly for recycling, after all, computers boards in addition to silicon, have gold and silver in, then we're not going to want to waste it, right? The hard work still goes on, and as a Silicon Mixer, you have the job of mixing all the basic elements that will be used in the process of manufacturing computer boards. 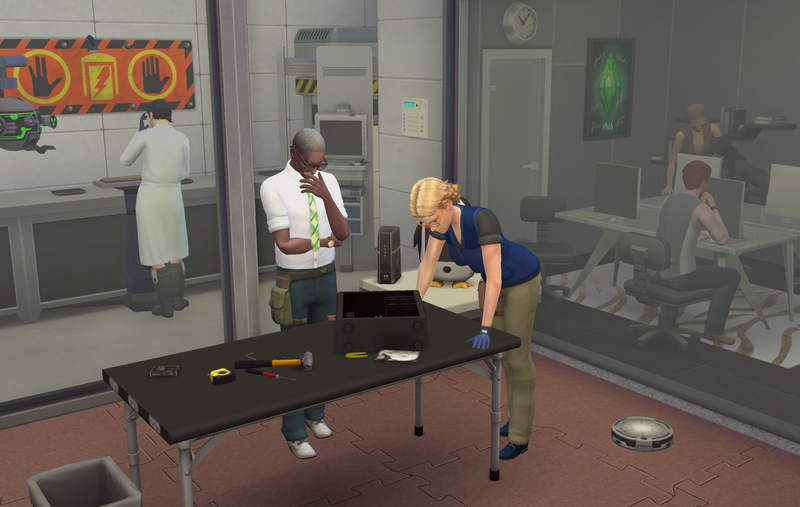 In addition to the heavy duty, you've gained a new scent that comes from the mixers, at least your new odor will ward off the annoying technophobic Sims. You've studied the basics of programming and so your supervisors have temporarily moved you to the software development department in the industry as a Beta Tester for test your basics programming skills. You need to test and report all problems such as bugs, encountered during software testing. In the end, just remember! That the bug fix process is not spray insecticide on the computer! Your supervisors gave you a promotion where you get back to dirty your hands, now you need to learn how to deal with welding and become a Soldering Whiz. This process is very important to learn how to repair parts and test your knowledge on handiness in hardware. Follow the printed traces on the circuit boards and steer the trace to success! You've reached a career position that needs to handle a lot of workload. As Technical Support you need to work on implementing new technologies, or deal with hardware or software maintenance, but mostly solving file a request from users with computer-related problems, in a nutshell help-desk services. But do not worry, sometimes when you will go to fix the problem, the user's computer will self-repair. At least temporarily, until he calls you again. It's time to take a sit a bit and use your logical and programming skills to work. You are now a Systems Analyst. Develop small programs, estimates new computer products needs, implement IT solutions and lead the small IT team. Try to drink a lot of coffee to stay awake and sometimes tea to calm down... For you will spend most of the time trying to explain in company meetings that the IT department does not handle installation or problems related to air-conditioners(A/C). You've gone through all the steps within your computing career and you saw that passion is precisely the part of creation, to deal more with the hardware manufacturing and design it, so is the Computer Engineer. Develop, create and bring to the world your trend in computers. Before designing, you need to plan and as a Circuit Designer you have this job. Focus on designing circuits using your logic skills to design the basics, and simulate your designs before deploying, after all any flaw can mean loophole for rebellion of computers machines against the Sims in the world. You have become a Microcontroller Specialist and now you need to integrate all the internal circuits correctly, try to unite and reduce as much as possible, then implement this technology into anything you see, it could be a pencil on your desk, a cup of coffee, even a simple paper clip, so you'll use the computers to fulfill Sims desires without them noticing ... And who knows, too, manipulates them? It's time to design computer machines that go beyond the simple 'Hello World', you are now the Thinking Machine Architect, develop robots and smart computers to satisfy the wishs of Sims. Just try not to leave loopholes for the rebellion of the computers machines and also, most importantly, try not to develop a smart computer machine capable of creating other smart computers machines, else you will lose your job. Really! Congratulations. Now who uses a computer device, is using a part of what you have created. Most of the design and assembly on computers have to have their signature and guarantee. You can be proud that, at least, the computers will have some of your beauty in from now on, and this is notable by other sims that use computer devices. You went through every step of your career and noticed that always liked how the computer can be controlled with implementation of new theories, using math logic and programming. So is the Computer Scientist, formulate, theorize, create software and new languages used by them. Be one of the brains behind computing. Now your job is to collect and manage data in computing and how they can be used in software projects to improve the day-to-day of life of Sims. 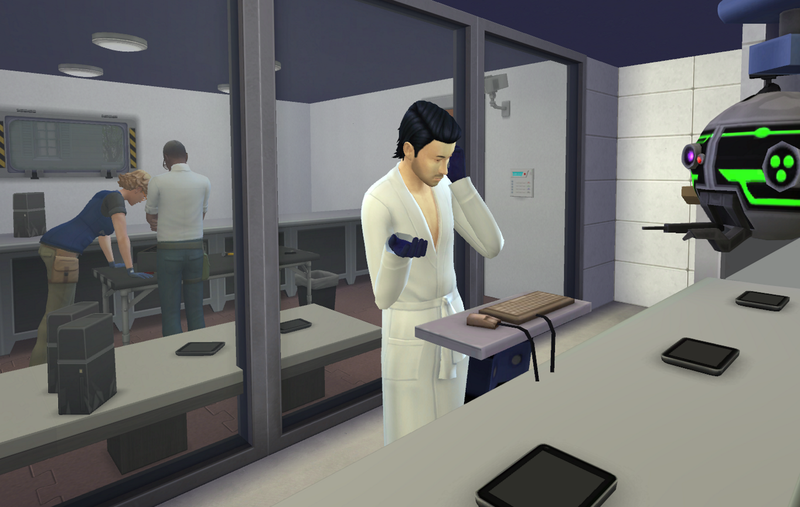 Develop and learn more about the deep desires of Sims, which in the end, you can even manipulate them to your will, through computer systems. It's time to program and define how the computer brain will work, and make you part of the brain behind the computers. Program computers using your logical and programming skills and set operating laws for computer devices, to ensure, that at least, YOU are not caught up in any possible machine computer rebellion. How will technology be in the future? What can be programmed to improve the life of Sims? How to use digital space to solve problems that do not even exist? 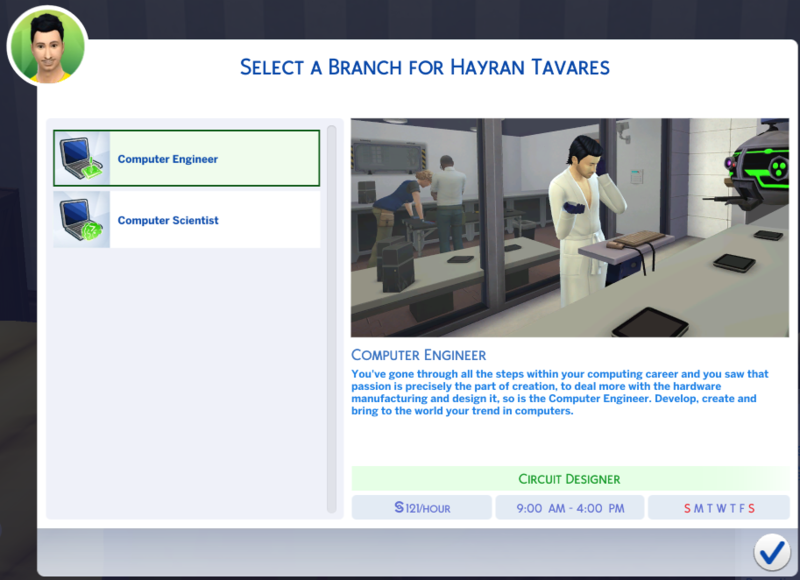 What will be of Sims without computer and computers without of Sims? Do we dominate the computers or do they dominate we? For this and other questions, you are responsible now for answering, elaborate logic mathematical to transform and the converter it in programming, to try, to predict a bit of the future, or to dictate as will be in part that. Congratulations. Now you known as Computer Genius, you are almost always asked to predict new technologies, approve magnificent projects, elaborate technological theories, approve new programming languages and set the course for computers machines, as well as do many lectures, and in the end, you can rest assured that you have completely mastered and control the way of thinking of the computers machines... Or not!